Send WhatsApp Message Without Adding Contact: Hey Guys I’m back again with New Latest Trick of Chat with unknown person without saving number. So here i’m going to tell you that How Can you Chat With Anyone on Whatsapp Without Saving Mobile Number. As you all knows that nowadays Whatsapp is the trending and fantastic application for Instant Messaging. We often here from so many peoples that Whatsapp me images, Video. Things Which we need to do is ask for their number and then we need to save it for Send Messages then we have to refresh WhatsApp Contact list on Whatsapp to find the Contact. Do you know this can be done in just seconds without saving the phone number? This is the reason today I am going to tell you a Easy Way to Chat With Anyone on WhatsApp Without Saving Their Number. Now, In the Android Their are so many Apps available for Do something new So, There are Many Android Application available for free which helps the use to send the messages directly this is for those who will be doing these thing every time whenever a new number appears in your phone directory and saving and refreshing the Number contact list. Nowadays you need to use Some Useful Whatsapp apps for How to Send Whatsapp Messages to Unsaved Number which is safe and protected. Our India Developer build an application which helps the users not to save the number every time before sending a message. This has made many other useful application too which you can have a look at this list but the best part about this app is that this apk doesn’t need a rooted Android Phone which is the best part of this Apk. Developer of this apps has also got so many downloads and an incredible rating of the application on the Google Play Store and you can download this app and enjoy it on your Android Phone without facing issue for How to chat on Whatsapp Without Saving Mobile Number. 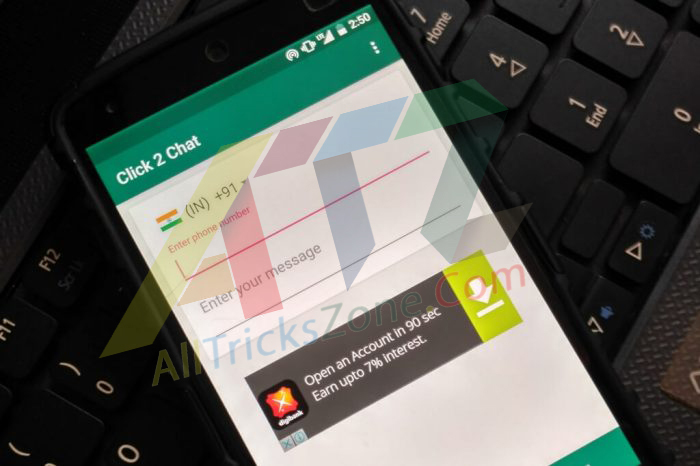 For Make this Tricks Successfully you need to Download and Install Click2Chat app which is having the 2 Amazing mind blowing interesting Features. This application is having the features such as Send the Message Later Means how to Schedule WhatsApp Message and you can also send the message now. In this application There are one of the features which are available in the telegram is that you can send the message to yourself. This is helpful when you are saving some kind of this message which you need to send it afterward. Previously we were shared an article on How to Get Enable WhatsApp Chat Heads on Whatsapp for chat with friends just like Facebook messenger. This application has such features which will help you out in this matter and The Very Best part About this app is that is very small in Size and it has a very simple user interface. This application is Used latest Material design for How to Send WhatsApp Message Without Adding Contact in iPhone Devices. Now, you message will be sent to your Friends WhatsApp after a Particular time. That’s it guys this was my easy way in which you can Send the Chat with Anyone on Whatsapp Without Saving Number. 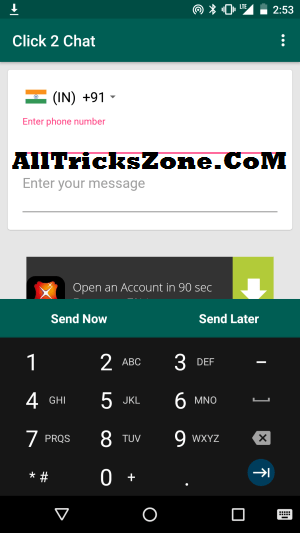 So, I hope you like my new article in which we have shared with you Full Guide of Send Messages on Whatsapp Without Saving Number. So if you are facing problem while following this easy Tutorial then please Comment on Below, Thanks for visiting please stay connected with us for more awesome stuffs like this.